derakhshanfard, F., vaziri, A., Fazeli, N., Heydarinasab, A. (2016). Optimization of Synthesis of Expandable Polystyrene by Multi-Stage Initiator Dosing. Iranian Journal of Chemical Engineering(IJChE), 13(1), 20-31. F. derakhshanfard; A. vaziri; N. Fazeli; A. Heydarinasab. "Optimization of Synthesis of Expandable Polystyrene by Multi-Stage Initiator Dosing". Iranian Journal of Chemical Engineering(IJChE), 13, 1, 2016, 20-31.
derakhshanfard, F., vaziri, A., Fazeli, N., Heydarinasab, A. (2016). 'Optimization of Synthesis of Expandable Polystyrene by Multi-Stage Initiator Dosing', Iranian Journal of Chemical Engineering(IJChE), 13(1), pp. 20-31.
derakhshanfard, F., vaziri, A., Fazeli, N., Heydarinasab, A. Optimization of Synthesis of Expandable Polystyrene by Multi-Stage Initiator Dosing. 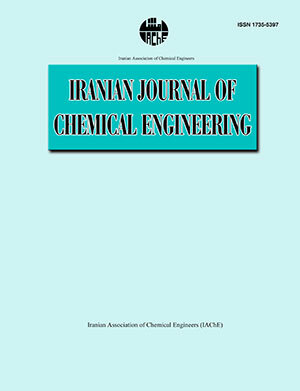 Iranian Journal of Chemical Engineering(IJChE), 2016; 13(1): 20-31. Suspension polymerization process is commonly used to produce expandable polystyrene. In the conventional method for producing this polymer, two different initiators are added to the process at two different temperature levels. In the industrial scale, this process is time consuming and difficult to control. A new method (Multi-Stage Initiator Dosing, MID) is proposed, in which, the initiator is dosed into the reactor. In the laboratory and bench scale tests of this new method results in better control of the process, shorter reaction times and better quality of the product. Optimum temperature and dosing intervals are determined. The properties of the prepared samples by MID and conventional methods are compared with each other. According to the results obtained with the implementation of new methods for the production of expandable polystyrene reduce time process and consuming amount of initiator and because the initiator dosing in several stages, the suspension control would be easier. Also absorption rate was higher pentane and grain size better than the conventional. Dowding, P. and Vincent, B., "Suspension polymerization to form polymer beads", Colloid Surface A., 161 (7), 259 (2000). Lenzi, M. Silva, F. and Lima E et al., "Semi-batch styrene suspension polymerization processes", J. Appl. Polym. Sci., 89 (17), 3021 (2003). Yuan, H. Kalfas, G. and Ray, W., "Suspension polymerization", J. Macromol. Sci-rev., 2 (84), 215 (1999). Kajimura, M. and Kaisha, S., US Pat. 4303757, (1981). Nikfarjam, N. Qazvini, N. T. and Deng, Y., "Cross-linked starch nanoparticles stabilized Pickering emulsion polymerization of styrene in w/o/w system", Colloid. Polym. Sci., 292 (13), 599 (2013). Pascal, N. and Jacques, C. US Pat. 012798, (2011). Shaghaghi, S. and Mahdavian, A. R., "The Effect of Sodium Dodecyl Benzene Sulfonate on Particle Size in Suspension Polymerization of Styrene", Polym-Plast. Technol., 45 (16), 109 (2006). Herman, H. A. Enschede, O. and Bart, F. et al, US Pat. 069983, (2011). Scheirs, J. and Priddy, D. Modern Styrenic Polymers. Wiley Series in polymer science, England (2003). Boevenbrink, H. G. and Hoogesteger, F. J. US Pat. 0111529 A1, (2006). Meulenbrugge, L. and Vanduffel, K. A. K. and Westmijze, H., US Pat. 0122330 A1, (2006). Swieten, A. P. V. and Westmijze, H. and Schut, J., US Pat. 6639037 B2, (2003). Rene, G. and Jacobus, S. and Willibrordus, O. J. et al, US Pat. 000916 A1, (2012). Meulenbrugge, L. and Swieten, A. P. V. and Vanduffel, K. A. K. et al, US Pat. 7173095 B2, (2007). Westmijze, H. and Swieten, A. P. V. and Meulenbrugge, L. et al, US Pat. 0046328 A1, (2011). Speikamp, H. and Kiihnle, A. and Bretschneider, J., US Pat. 5189069, (1990). Zhang, L. and Shi, T. and Wu, S. et al., "Sulfonated graphene oxide: the new and effective material for synthesis of polystyrene-based nanocomposites", Colloid. Polym. Sci., 291 (7), 2061 (2013). Parsa, M. A. andGhiass, M. and Moghbeli, M. R., "Mathematical Modelling and Phase Separation Kinetics of Polystyrene/Polyvinylmethylether Blend", Iran. Polym., 20 (9), 689 (2011). Li, H. Wu, S. and Wu, J. et al.," A facile approach to the fabrication of graphene-based nanocomposites by latex mixing and in situ reduction", Colloid. Polym. Sci., 291 (8), 2279 (2013). Wang, S. Chen, H. and Liu, N., "Ignition of expandable polystyrene foam by a hot particle: An experimental and numerical study", J. Hazard. Mater., 283 (8), 536 (2015). Chen, W. Hao, H. and Hughes, D. et al., "Static and dynamic mechanical properties of expanded polystyrene", Mater. Design., 69 (10), 170 (2015). Ferrándiz-Mas, V. and García-Alcocel, E., "Durability of expanded polystyrene mortars", Constr. Build. Mater., 46 (7), 175 (2013). Vaitkus, S. Granev, V. Gnip, I. et al., "Stress Relaxation in Expanded Polystyrene (EPS) Under Uniaxial Loading Conditions", Proc, Eng., 57 (9), 1213 (2013). Su, J. J. Yang, G. and Zhou, T. N. et al.," Enhanced crystallization behaviors of poly(ethylene terephthalate) via adding expanded graphite and poly(ethylene glycol)", Colloid. Polym. Sci., 291 (6), 911 (2012). Derakhshanfard, F. Fazeli, N. Vaziri, A. and Heydarinasab, A., "Kinetic study of the synthesis of expandable polystyrene via “multi-stage initiator dosing” method", J. Polym. Res., 22 (6) (2015).